Picasso said “I don’t paint what I see, I paint what I imagine”, or something along those lines. When you see his work, it does explain what he was at. I have to say I would also work from imagination, based on something I saw, or a thought, or idea on some subject or other. The real world never quite measures up to what is required to produce an interesting painting. Every artist has their own working method and part of my method is my concern about overworking, which I’m prone to. The finished painting always seems to have something unfinished. But the surprising thing is, on the following day, everything looks OK. So the advice is, set limits to your painting session. It can be time limits, area to be covered (eg. the sky), etc, then stop, and assess the work the following day. Another area of overworking is in the planning of the painting. I find thumbnail sketches are the best for my method and I have included a few photos of what I mean. These sketches are so small (the full pages are A4 size) I can’t get involved with details. The details are added, or not added, during the painting process. The plan never seems to work out the way I intended, so the plan is continually adjusted based on what is already done. In the sketches above, you will see the plans for some of the recent paintings I’ve posted here. The single sketch above (about 2″x3″) is for the next painting, just completed, which I will post next time. It contains some of the elements (birds and scarecrow) I was going to include in Abandoned House, but the plan changed. Here’s the video. For more on materials, etc. check previous post. 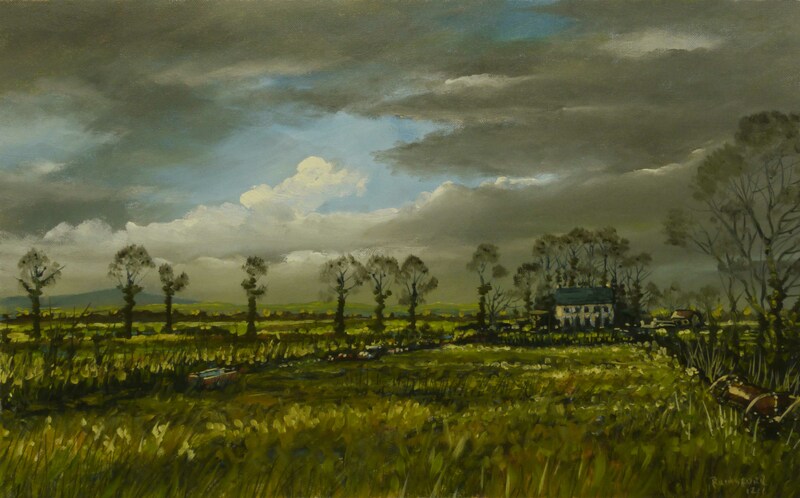 This entry was posted in Oil Painting and tagged Art, Culture, Education, Inspiration, Irish landscape, Oil Painting Instruction, Time lapse painting. Bookmark the permalink. Thank you for the insight and how to start a painting. I will use this for my paintings. Thanks ever so much Liam. Very engrossing. It’s very rare that just about anything but a film can keep my attention for ten minutes. I was transfixed. Cheers and a happy happy new year. Hi Liam. Thanks for liking my blog. I looked at a few of your blogs, you are an amazing artist. Thanks for sharing your videos. Your technique is unique. Your view of colour is fascinating. My favourite part of most of your paintings are the skies. The way you begin and the way they end up. How long did it take to ocmplete the abandoned house painting? The sped up video makes it look easy-peasy but I know it tokk time and skill. Thanks for your nice words. In the big world of the internet its nice to hear from someone just ‘over the hill’ from myself. My paintings take from 1 to 3 hours. Abandoned House – less than 2 hours. My ‘alla prina’ method has to be fast. The shadows are mostly solvent and begin to dry after about an hour, lightening the tone of the darker colours. If I wait for too long I’d have to let the painting dry and ‘oil out’ the work done before proceeding – something I hate doing. I like your clean colours and straightforward subject matter. Keep up the good work. Thanks again.